If Advani’s 1990 Ram Rath teaser-trailer threatened India’s composite culture for the first time since its independence, then the Modi era has unleashed sectarian violence on a scale previously unimaginable. For the rampaging mob and their backers – including Bharatiya Janata Party’s Lal Krishna Advani, currently facing trial for conspiracy charges in the Babri case – the mosque deserved its painful end because it had been built by demolishing a pre-existing grand Ram temple. Babri’s demise at the hands of parivar hooligans made India hang its head in shame. Newspapers wrote searing editorials condemning the outrage. Conscientious citizens swore to guard against further assaults on the nation and its constitution. Tragically, they failed. Twenty-six years after that cataclysmic event, violence has become the leitmotif of the Indian experience and existence. We haven’t seen a mosque perish in the manner of Babri, but we are seeing humans, mostly Muslims, being done to death amid thriving anti-Muslim bigotry. We are used to the media toeing the government line. However, for the first time, a large section of the media has become complicit in the government’s ideological agenda, especially TV channels. The poison has empowered the mobs who will kill anyone standing in their way – as is evident from the recent killing of a policeman in Bulandshahr. On another day, the mischievous Google Maps insertion and the tech giant’s feigned bewilderment over how that came to pass, might have made for a good laugh. But not today. Not in Narendra Modi’s India. Not at a time when ‘Mandir yahin banega’ has become the defining chorus that will not brook a single discordant note – even if that should come from the highest court of the land. The fact that the Ram Janmabhoomi-Babri Masjid title suit is pending before the Supreme Court has not made an iota of difference to the majoritarian mood on the temple. If there is a difference of opinion, it is over whether legislation should be enacted to pre-empt the court verdict or the hearing should take place as determined by the court. Those favouring the latter option – and this includes Modi and BJP chief Amit Shah for now – are doing so not because they are prepared for the verdict to go either way, but because in their calculation, the court has no option but to bow to the temple sentiment. In that sense, the title suit hearing is a temporary inconvenience that will give over once the court green-lights the temple. If it doesn’t, the temple will be had by force. Amit Shah made this clear at an election rally held soon after the apex court’s decision to push the Ayodhya case to January 2019. Responding to cadre fears that the delay might adversely affect temple construction, Shah said: “Isme ek inch bhi waapis aane ka sawal nahi hai. (There’s not a chance that we will back off even an inch)”. 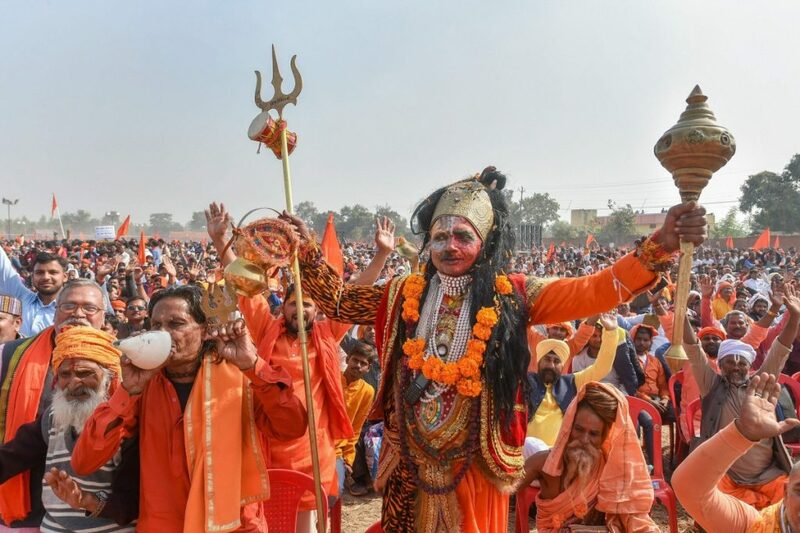 With the crowd chanting ‘Jai Sri Ram’, Shah asserted that the BJP was committed to building the temple at the exact spot where Ram Lalla resided – where the Babri Masjid had stood. The threat to the court and the larger polity to desist from even considering the masjid option was always implicit in the theme song of the Ram mandir movement: ‘Ram Lalla hum aayen hain; Mandir wahin banayenge’ (baby Ram we have arrived, we will build the temple right there). The Ram Janmabhoomi movement was the springboard that provided the perfect take-off to Hindu majoritarianism. India slowly changed and the Nehruvian consensus on civility in discourse collapsed when Muslims began to be targeted to the roaring approval of a section of Hindus. 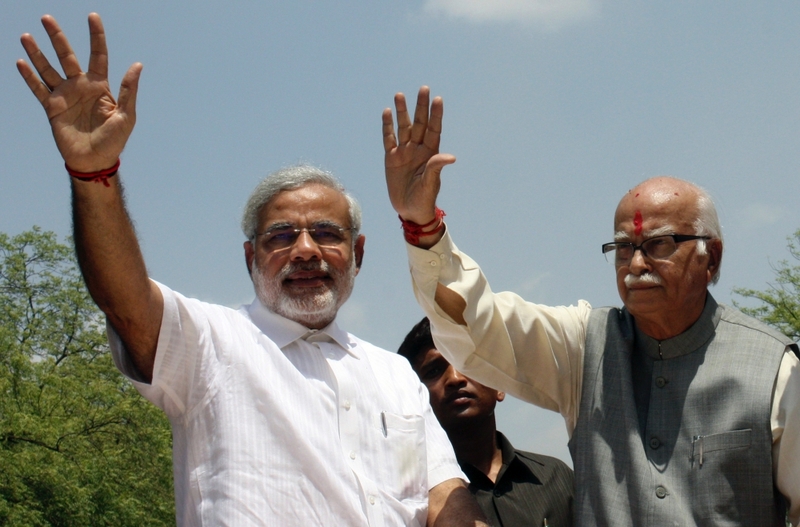 Advani’s Ram Rath Yatra sanctioned a new permissiveness in the use of language. Phrases such as ‘pseudo-secularism’ and ‘minority-appeasement’, which were lapped up by Advani’s followers, and which have since got deeply embedded in the Hindu consciousness, were pejorative to Muslims and were intended to be so. It was as if the floodgates of communal hate had been opened. The repressed Hindu who had held his punches was now at liberty to out his darkest, innermost resentments. A tidal wave of hostility lashed at Muslims as also all those seen to be supporting the secular principle. India’s foundations were creaking. Yet, for all the success of Advani’s Hindutva experiment and the BJP’s two stints in government, the temple remained an on-again, off-again parivar cause. The BJP and its affiliates couldn’t steer temple-building to its logical end because the diversity of the land, the multiplicity of political parties that banked on Muslim support and the BJP’s lack of a parliamentary majority, all acted as powerful hurdles in the way of ideological unilateralism. The BJP was forced to place the mandir issue on the back burner by its allies in the National Democratic Alliance and it stayed there through the time Atal Bihari Vajpayee was in power. 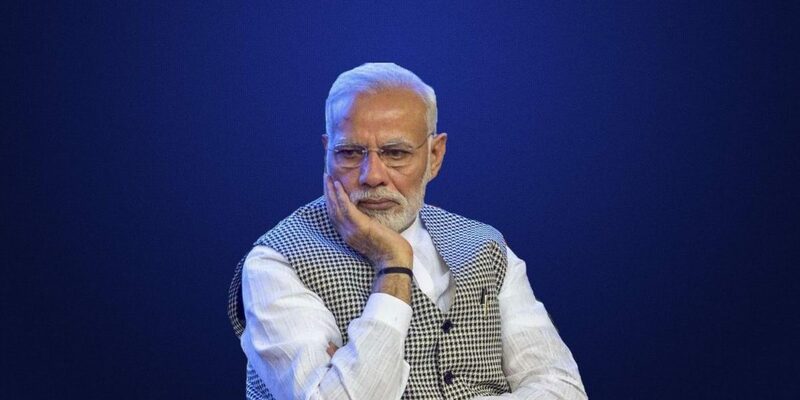 On the stump in the 2014 Lok Sabha election, Modi sold the mythical ‘Gujarat model’ to wide-eyed audiences that believed he would magically lift them out of their poverty and misery. But while Modi worked the crowds with sweet promises, Amit Shah played the communal card. In Muzaffarnagar in western Uttar Pradesh – the scene of a horrific communal conflagration in 2013 – he stoked Hindu aggression by urging them to take revenge, which earned him a police case and a ban on further campaigning by the Election Commission. The ban was revoked later but Shah’s speeches provided a peek into the kind of sectarian rule that awaited Indian citizens. In the event, Narendra Modi entered the Prime Minister’s Office on the back of the first single-party majority in 25 years. The strength of that majority plus public adulation for the prime minister liberated the BJP from every restraint that had previously held it back. With every passing year, the BJP, under Modi and Shah, has pushed the envelope further and further on Hindutva and minority exclusion. If earlier brazen acts of terror against Muslims were attributed to the loony fringe, today the BJP has made the fringe irrelevant. There is no curse that is too extreme or repugnant for BJP ministers and legislators to use against Muslims. 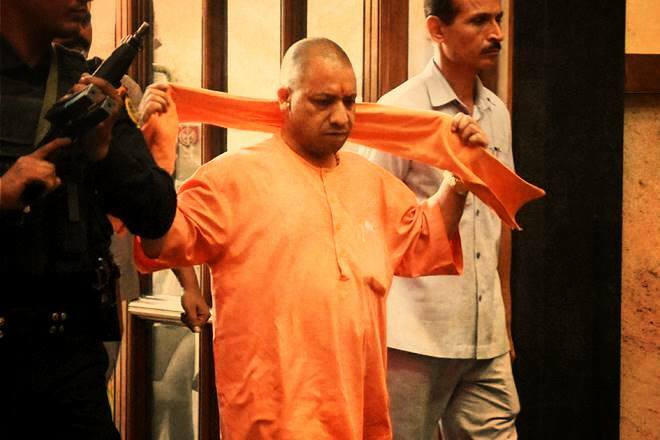 Uttar Pradesh chief minister Adityanath, whose appointment defies understanding unless seen as part of the polarisation objective, presides over a regime whose hallmark has become lawlessness. His government has killed Muslims in encounter deaths, passing that off as deserved retribution for their alleged criminal acts. 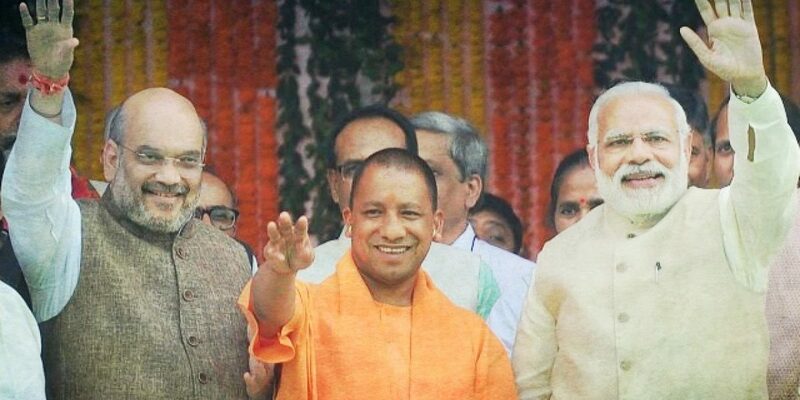 Lately, Adityanath has been drafted for campaigning in other states where his single focus has been to create a Hindu-Muslim divide. At a rally in Madhya Pradesh, he called for a fight between the Congress’s Ali and the BJP’s Bajrangbali. His meetings typically end with the provocative slogan: “Arre raj tilak ki karo tayyari, aa rahen hai bhagwa dharee (Get ready to be crowned, the saffron-clad are arriving)”. For Amit Shah, the only way to attack the Congress has been to attack the party’s alleged Muslim vote bank. Towards this end, he has used whatever comes handy, including resorting to fake news, faithfully propagated by friendly TV channels. On TV, he can be seen vowing to “mercilessly uproot” all those failing to prove their citizenship except those that are Hindus. 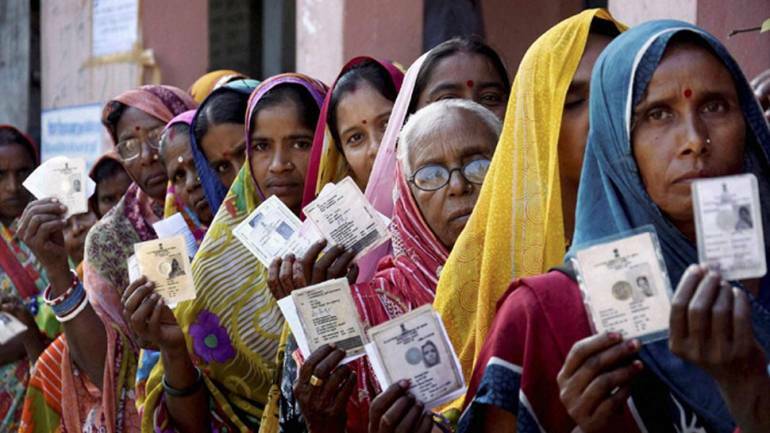 Modi has, of course, perfected the art of winning lost elections by a last-minute stoking of communal passions. In an April episode of ‘Reality Check’ anchored by Srinivasan Jain, NDTV unveiled data that showed an increase of 490% in VIP hate speeches since the coming of Modi in May 2014. There were 125 instances of VIP hate speeches compared to 21 instances under UPA-II. Ninety percent of hateful comments made during this period were by BJP politicians. But it is what Narendra Modi’s political model has done to the polity as a whole that is most disturbing. His hectoring and name-and-shame style of addressing issues has stamped out the last vestige of dissent in the matter of the temple – and not just the temple but a host of other fundamental issues, including, most importantly, India’s identity as an exuberant embracer of multiple traditions, faiths and cultures. Indeed, if Advani’s 1990 Ram Rath teaser-trailer threatened India’s composite culture for the first time since its independence, then the Modi era has unleashed sectarian violence, both physical and verbal, on a scale previously unimaginable. The troika of Modi, Amit Shah and Adityanath have created a climate of hate so intense and uncontainable that it has taken everything in its sweep: India’s institutions are now stuffed with Hindutva ideologues; political parties have been emasculated and prevented from taking robust positions on the country’s plural-secular ethos and an army of trolls has taken over the social media, issuing death threats to those refusing to sign up for Hindutva and Modi. The infection has turned into an epidemic. Recently, residents of a Mumbai neighbourhood took out a protest march against the construction of a mosque that had all the permissions. Just one example will suffice to show the level to which discourse has fallen. Recently, Shahid Siddiqui tweeted that ‘love jihad‘ was a bogus coinage used only to target minorities. In response, he got a torrent of abuse. The mildest among them said: “At 17 crores, YOU are not a minority in India. You are a WHOLE bloody Pakistan in India.” However, it is not Siddiqui alone but anyone who is seen as a liberal who is under vicious attack. The pseudo-secularists of Advani’s time are now proud recipients of several new epithets: sickular, presstitutes, love-jihadis, tukde-tukde gang and lately, urban Naxals. Also read: Why Are So Many ‘Urban Maoists’ Surfacing All of a Sudden? The political class instead of taking the communal bull by its horns, has too easily succumbed to the coercion and intimidation that have come its way: “Don’t mention Muslims, don’t meet Muslims” has become the default setting for politicians. The effect of this can be seen most alarmingly in the frantic way the Congress is emulating the BJP and following the agenda set by it. Rahul Gandhi, who started by visiting temples has now transformed into a proud janeudhari Brahmin who will flaunt his gotra for the media to pick up and sensationalise. Gandhi’s key advisor sees no irony in boasting that the Ram Mandir in Ayodhya will be built by him and not the BJP. It’s clear now that is not Hinduism taking on Hindutva, but Hinduism on an increasingly slippery slope. There is only one place Rahul Gandhi can build the temple in Ayodhya and that is where the Babri Masjid once stood. In reality, Rao backtracked on his promise because he had detected the march of Hindu majoritarianism. But he at least made the promise and he recalled the promise. Would any leader of any political party today dare mention the possibility of the Babri Masjid being reconstructed? If not in the same place, somewhere else in Ayodhya? If not in Ayodhya, someplace, any place in India? No. Forget that. The words mosque and even Muslim have been banished from public discourse. In its 1991 manifesto, the BJP spoke of relocating the mosque with due respect. Today, let alone any leader from the BJP, any leader from any other party saying this is asking to be lynched. Modi’s India trolled and skewered Rahul Gandhi for daring to meet Muslim intellectuals. In response, he has offered, not his great-grandfather Nehru’s beautiful, inclusive vision, but himself as a janeudhari Brahmin.